Elkton, SD, ½ mile East on tar road 217th. This auction presents an excellent opportunity to purchase 80 +/- acres of good, ALL TILLABLE land. Now is the time if you are in the market for land that could serve as an outstanding addition to a row crop farming operation or investment opportunity. Nearly All Tillable with high return opportunities! FRIDAY, MAY 25, 2018 SALE TIME: 10:00 A.M. 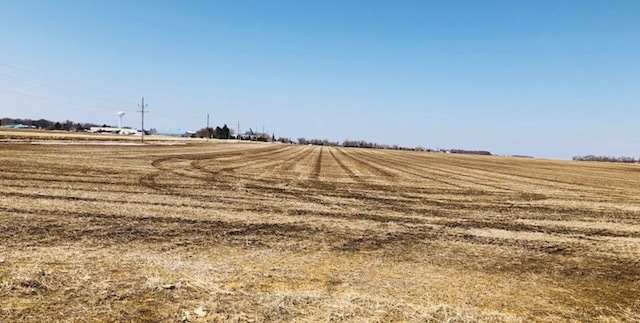 This is an exceptional, all tillable (except for roads & ditches) farm with great eye appeal that is located right on a tar road and is in a strong agricultural area close to grain elevators, the ethanol plant, and producers with manure. If you have been looking for an all tillable 80 acre farm it will be tough to find one that looks better than this one! This farm lays level and has good access on both the south and east sides, and boarders the city limits of Elkton. According to the FSA Office the farm has 76.64 cropland acres with a corn base of 37.67 acres with PLC yield of 140 bu., and a soybean base of 27.04 acres with PLC yield of 38 bu. According to the Brookings Co. Equalization Office this farm is predominantly made up of strong Class I & II soils and has a Productivity Rating of 74, making this a strong corn and soybean farm. This farm represents an excellent opportunity to add to your farming operation or investment portfolio with the opportunity of strong cash rents. The farm is leased for the 2018 crop year, and the new buyer will receive the full rent credit at closing! TERMS: 10% non-refundable earnest money deposit due day of sale with balance due on or before June 25, 2018. Closing fee and title insurance split 50/50 between buyer and seller. The seller does not warranty or guarantee that existing fences lie on the true & correct boundary and any new fencing, if any, will be the responsibility of the purchaser pursuant to SD statutes. New buyer will receive a rent credit at closing; property is leased for the 2018 crop year. Seller will pay all 2017 RE taxes, payable in 2018; buyer will pay 2018 RE taxes, payable in 2019. This property is sold subject to easements and restrictions, if any, reservations and/or highways of record, and is sold subject to confirmation of owner. Information contained herein, and all statements made herein are believed to be accurate but not guaranteed. Any announcements made the day of the sale shall take precedence over written materials. Auctioneers represent the seller, Jon Vaske Living Trust, in this transaction. Buyer or seller may elect to do a 1031 Exchange.